The faint hum of hand bells and holiday carols can be heard from Hotel Galvez & Spa®, A Wyndham Grand® Hotel, as it prepares for the holiday season with Thanksgiving Getaway and Holiday Magic packages to celebrate Galveston Island’s many seasonal festivities. In honor of the Galveston Holiday Lighting Celebration, a free family event, Hotel Galvez & Spa is offering the Thanksgiving Getaway package, available from Nov. 27-Nov. 29 or Nov. 28-Nov. 30. 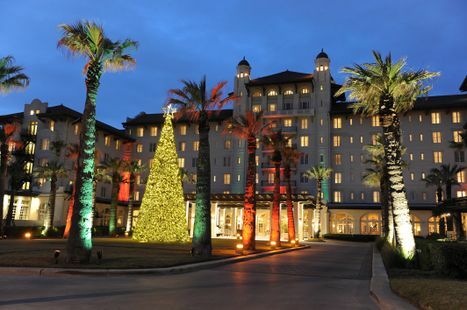 The package includes a two-night stay, Thanksgiving brunch for two, complimentary valet parking and courtesy shuttle service to Galveston’s historic Strand District for shopping and Lasers, Lights and Magic in the Park. 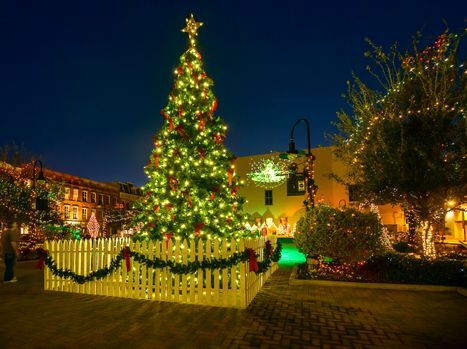 The Galveston Holiday Lighting Celebration begins at 6:00 p.m. on November 29 with Santa Claus on horse-drawn carriage followed by the lighting of the hotel’s 35-foot Christmas tree on the front lawn. Entertainment includes the Galveston Ballet, Moody Festival Ringers, Fanfare Lutheran Music Academy Chorus and other local talent. Dickens on The Strand’s Queen Victoria and the Nesquik Bunny from Nestle Toll House Café will also make special appearances during the festivities. Additionally, children can have photos taken with Santa and receive a small gift. Photos with Santa by Rhea’s Photographic Art will be available for purchase. As part of the evening, Hotel Galvez will accept monetary donations for the Salvation Army to help those in need. On Saturday, Nov. 30, Galveston’s historic downtown will sparkle as Saengerfest Park hosts Lasers, Lights and Magic in the Park beginning at 6:00 p.m. and open to the public. Saengerfest Park transforms into a holiday marvel with music, a special appearance by Santa Claus, and a holiday-themed laser light show. To add to the fun, visitors can send text messages to make it snow in tropical Galveston. Lasers, Lights and Magic in the Park continues through Dec. 31 and offers a daily 15-minute holiday themed laser light show at 6, 7 and 8 p.m.
Additionally, the hotel is offering a Holiday Magic package connected to Galveston’s Passport to Holiday Magic program which offers visitors a downloadable “passport” to keep track of the “Winter Wonderland Island’s” more than 1,000 holiday events. Guests who have their passport stamped at five or more participating holiday events are eligible for numerous giveaways including a cruise for four on Carnival Magic. The Holiday Magic package includes a $50 food and beverage credit, complimentary valet and the first Passport stamp toward valuable prizes. See special offers at www.WyndhamHotelGalvez.com. The hotel’s shuttle is also available to transport guests to Galveston’s downtown for shopping and holiday festivities. Santa Claus will also make an appearance during Sunday Brunch with Santa on Dec. 1, Dec. 8, Dec. 15 and Dec. 22 from 11 a.m. to 2 p.m.
Wyndham Hotel Group is the world’s largest hotel company with approximately 7,440 hotels and over 638,300 rooms in 68 countries under 15 hotel brands. Additional information is available at www.wyndhamworldwide.com. For more information about hotel franchising opportunities visit www.whgdevelopment.com.